Aidan and Olivia live in a creaky old house on the edge of a dirty, swampy lake. Craving some excitement, they convince their parents to let them camp out by the lakeshore under a full moon, with only their dog for company. Aidan loves to scare his sister and has plenty of funny tricks up his sleeve for their campout. 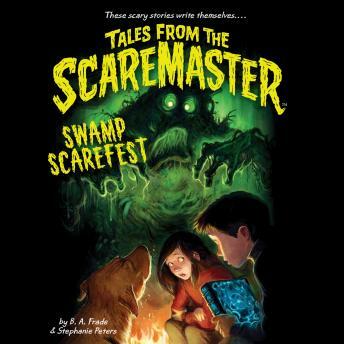 But the twins are about to find out that the creepy old book that washed ashore, Tales from the Scaremaster, has a mind of its own--and its mind is set on scares beyond Aidan's wildest dreams! When the story in its pages about Aidan, Olivia, and a swamp monster starts coming to life, Aidan and Olivia are in a whole mess of trouble. Can they find a way to outrace and outsmart the monster and the Scaremaster...or will they end up as swamp sludge? Frightfully funny tales come to life in this thrilling new series, perfect for fans of Goosebumps.